budapest-based architects daniel balo, zsofia dobos, dora medveczky, judit emese konopas and noemi varga have designed the nanushka beta store in budapest. the collaborative design group was recruited by advertisements posted by sandra sandor, the designer of nanushka, on their university campuses. in three weeks, the collective fashioned a space in which the previous interior has been left intact. the warm, rugged store, measuring 80 meters squared is draped with linen and cotton by a rigging system, encompassing the ceiling space of the interior. the softness of the fabric is accented by firewood and rusted steel details. floor construction for the retail unit was accomplished by slicing firewood into small circles, then securing these elements to the ground. 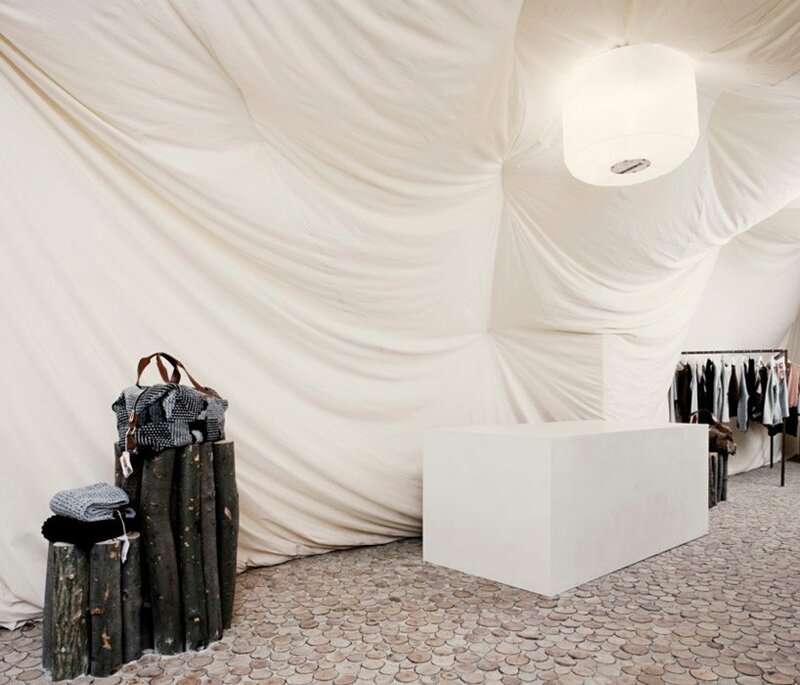 smaller display stands are formed from bundles of logs, while clothing racks made from rusted steel contrast the softness of the linen drapery of the walls and ceiling. the organic aesthetic is enhanced by spherical lanterns hanging from the ceiling. white linen poufs mirroring the shape of the lanterns are grouped around the store interior for store goers to rest upon.